ATOMIC WEIGHT – 107.8682 – MELTING POINT – 961.78 DEGREES C. / 1763.20 DEGREES F.
Midwest Refineries does not accept the following Silver. Midwest Refineries does not accept silver-plated material. We do not accept U.S. clad silver coinage (1965 to present). We do not accept silver electrical contacts. Midwest Refineries does not accept Silver brazing wire. We do not accept any foreign coinage. We do not accept nickels. We do not accept any magnetic silver materials. Midwest Refineries no longer accepts any weighted sterling silver. Some sterling silver items like candlesticks and pedestal style containers and bowls, are weighted with wax, plaster or fillers with steel support rods for strength. Dinner knives from sterling flatware, have stainless steel blades with steel support rods and filler that run through the sterling silver handle. The silver is then poured or molded over this material in the manufacturing process. All sterling silver must be free of all stainless steel and weighted filler like wax, cement, plaster, support rods and glass. If you attempt to strip your sterling silver of its weighted materials, we recommend the use of gloves and protective eyewear. Smelters and refiners that claim to pay 98% or 99% for your precious metals, also charge refining fees, assay fees, treatment charges, brokering fees, inbound troy ounce weight fees, handling fees and other fees. Nobody can operate a business on 1% or 2%. 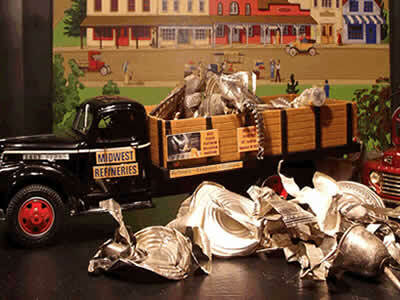 Midwest Refineries pays 90% of the amount of pure silver contained in your order for sterling silver (.925), like flatware and jewelry, photographic and electrolitic silver flake, and U.S. coin silver (90%). Midwest Refineries pays 92% for pure silver (.999) bars, and coins. 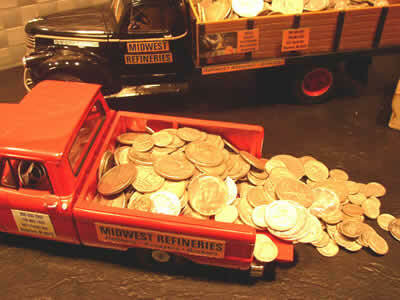 Midwest Refineries pays 80% of the amount of pure silver contained in 800 silver. Silver orders under 10 troy ounces are purchased outright, based on average after melt weight loss and purity. Silver orders of 10 troy ounces or more are melted and assayed to determine exact silver content. You receive 100% of the market or spot price on the day your order is completed and ready for settlement. Gold, silver and platinum bars, coins and rounds. Call for availability and pricing. Archaeological evidence shows that people have been using silver for at least 5000 years! Silver is obtained from pure deposits, from silver ores such as argentite (Ag2S) and horn silver (AgCI) and in deposits of ores containing lead, gold or copper. Pure silver is the best conductor of heat and electricity of all known metals, so it is sometimes used in making solder, electrical contacts and printed circuit boards. Silver is also the best-known reflector of visible light, but silver mirrors must be given a protective coating to prevent tarnishing. Silver has been used to create coins, although today other metals are typically used in its place. 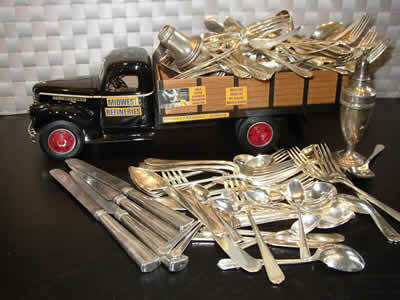 Sterling silver, an alloy containing 92.5% silver, is used to make silverware, jewelry and other decorative items. High capacity batteries can be made with silver and zinc and silver and cadmium. Silver nitrate (AgNO3) is light sensitive and is used to make photographic films and papers. Silver iodide (AgI) is used to seed clouds to produce rain. Kodak and Fuji companies are the world’s largest consumers of silver. 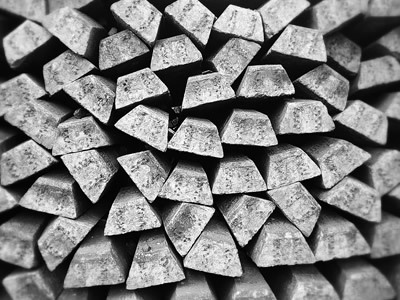 The main producers of silver are the United States, Mexico and South America. In 2003, 351 million ounces of silver were used for industrial application, over 196 million ounces of silver were committed to the photographic sector and 266 million ounces were consumed in the jewelry and silverware markets. Silver is the best electrical conductor of all metals, so it is used in many electrical applications, like conductors, switches, contacts and fuses. The old expression, “born with a silver spoon in his mouth”, is not a reference to wealth, but to health. In the early 18th century, babies who were fed with silver spoons were healthier than those fed with spoons made from other metals. Silver pacifiers found wide use in America because of their beneficial health effects. Silver has a variety of uses in pharmaceuticals. Silver sulfadiazine is the most powerful compound for burn treatment. It is used by every hospital in North America for burn victims, to kill bacteria and allow the body to heal the burn area. Joseph Nicephore Niepce created the first photographic image, by a camera-like devise in 1813! It was silver nitrate that made it possible. Approximately 5,000 color photographs can be taken using one ounce of silver. Silver is employed as a bactericide and algaecide in water purification systems in hospitals and more recently in domestic households. Midwest Refineries is a family owned precious metal refinery, that has earned a reputation of trust and service. All silver metals are accurately processed to recover the highest settlements for our customers. We are buyers, smelters and brokers for sterling silver scrap, photographic silver flake, silver bullion, bars and coins, coin silver pre-1965 (90% content), and industrial silver wire and sheet. 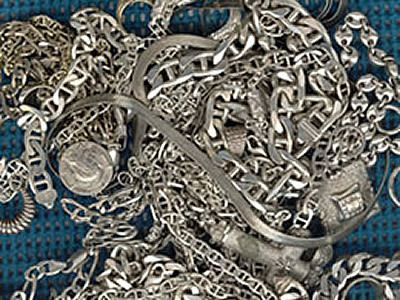 We are buyers of all silversmiths bench scrap and findings, excess sterling silver inventory and all precious metals containing recoverable silver content. We are proud of our reputation as silver refiners and will continue to uphold that reputation with honest and fair handling of all our customers’ silver material. Call us anytime, to discuss how we may be of help to you. 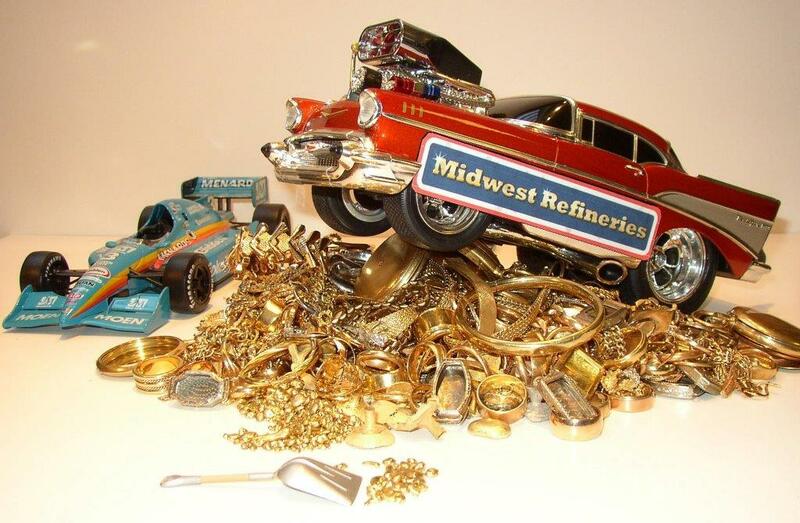 Many of the images of precious metals on our website were taken using scale models from Midwest Refineries die cast metal toy collection. Hi Gary, We recently sent some sterling silver flatware and a gold crown. Before we knew it, a check had arrived in the mail. We had a great experience with you all the way around, from our first viewing of the website, to the clear shipping instructions, to rapid payment. It was a pleasure doing business with you. John F. Omaha, NE. 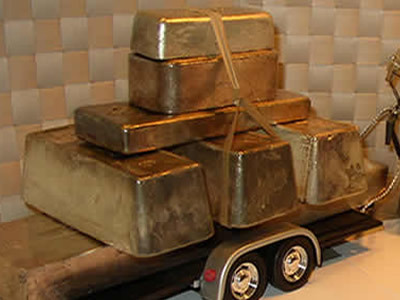 “Hello Gary, I called you recently with some questions about sending you some scrap silver I had been accumulating. You were very helpful, thorough and informative in your explanations. Thank you for you patience in answering my questions. I sent my silver to you and today I received my settlement. I am EXTREMELY satisfied with the amount I received (5 times more than my local jeweler) but mostly the speed and quality of your service. I will definitely recommend you to everyone I come in contact with. You are definitely the only refiner I will ever need. You truly do business the old fashioned way with integrity, trust and service. Once again, thank you very much.” Patrick O., MI. “Dear Gary, I was pleasantly surprised when I picked up our mail this morning and found your check enclosed. Thank you for the unbelievably quick and very fair service. Also, I want to apologize for the filler residue that you found in the handles. I really tried hard to get it all out, and thought that I did. I guess I should have cut the handles open to check closer. Sorry about that. Again, thanks for the good service, and I would recommend Midwest Refineries to anyone selling precious metals. Have a good day!” Jerry B., MT. “…sending some more scrap sterling silver jewelry. You make this whole thing so easy and reliable…I just want to thank you. You are my only source for turning in my scrap sterling silver…You are what a business should be…down to earth, friendly and reliable…a business handled the old way…again thank you.” Charles A. N, OH. “Dear Midwest Refineries, enclosed is silver scrap findings, sheet stock, bench grindings and castings from my shop. This time I would like my settlement to be in the form of 1 ounce silver bars, with any extra sent in a check. Thanks again for your expert service on my sterling scrap.” Regards, G. K. TN. “Hello Gary and company. We would like to thank-you for the efficient handling of our photographic silver flake material sent to you in May. Here is a container of more of the same. Looking forward to sending in more as we accumulate it.” Sincerely, Bill W., NV. “Midwest Refineries….and appreciate Candy taking the time to answer our questions regarding the sale of our Silver Bars. We were very satisfied with your professional transaction and have recommended your company to others wishing to sell bullion.” Sincerely, Susan M. WI. “Midwest Refiners, I received my check for all the sterling silver I shipped to you. I’m delighted with my settlement and will continue to use your company when I have more. Thanks for the fast service too.” Sincerely, Frank A., KY.
“Dear Sir, we have received our check for the pure silver plating anodes and can’t thank-you enough for the professionalism given us regarding this material. We will only ship to you in the future, as we were more than satisfied with our transaction at Midwest Refineries.” Sincerely, H.W., IL. “Dear Gary, I received more than I expected for sterling silver jewelry scrap sent in for smelting and liked the personal note at the bottom of my report. It seems you really do business the “old fashioned way” as stated on your companies website. Quite a refreshing change, especially in this day and age. You will hear from me again.” Regards, Dianne H., MI.